Our location at Copes Islander Oceanfront B&B is one of the hottest spots in the Comox Valley for salmon fishing. The beach just steps from our door is a popular place with the local fishing enthusiasts for beach casting when the salmon run to shallower water in September and October. Some of the best deep water fishing Vancouver Island has to offer is right off shore. 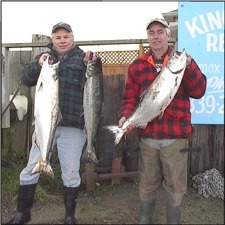 A short walk away is King Coho Resort which offers boat and gear rental as well as guided fishing excursions. The Comox Valley also offers some of Vancouver Island's best fly fishing for trout and steelhead in many well stocked lakes and streams. The information below is taken from the Comox Valley Fishing Report which is produced and updated regularly by Gwyneth Taylor of King Coho Resort. What a fabulous summer to be on the water! Lots of beautiful sunny days to enjoy and some great fishing too. The fishing season started to heat up in late May when the first new runs of chinook appeared in our waters. The month of June and early July were hot and then things cooled off a bit during late July and early August. But - the bite was back on in late summer and early fall with some super fishing for coho, pinks, chinook and chum. The hot fishing spots are fairly predictable from year to year, and 2003 was no different. Most fishermen headed for the "hump" in the Seal Bay area, or 2-3 miles straight out from the King Coho ramp, or off Cape Lazo. For those that fish further south, the south end of Denman and Hornby Islands is always a favourite. During the daytime, the salmon were primarily being caught in deep waters, between 125 and 200 feet down; however, in the evening, there was often some great fishing to be had between 40 to 60 feet down, especially along the shoreline and off Cape Lazo. Once again, the hot lures were consistent with last season. If you were trolling, it was hootchies in green and white, army truck or plain white; and spoons, especially in cop car colours. The beachcasters largely stayed with their BuzzBombs and ZZingers. While the summer fishing is over, don't forget that there is normally some great winter spring (chinook) fishing in January and February. And then, before you know it, spring will arrive and it will be time to get ready for another fun fishing season in the Comox Valley. The shorelines along Little River, Royston and the Comox Harbour have been producing some nice pinks and the beach fishermen at King Coho/Little River have also been getting some nice coho lately. If you are out in your boat, try bucktailing or trolling shallow, as the coho will be anywhere from the surface down to about 80 feet. This is an excellent time of year to chase the mighty Tyee (chinook salmon over 30 lbs). Try trolling herring strip or a spoon or a black/white Apex, at a depth of about 60 feet, in the evening, from King Coho to Cape Lazo. There have been lots of big fish pulled out of those waters. Chum season is just around the corner. Starting in early October, you can expect to find them in large numbers. Troll with a pink or purple hoochie or squirt and get ready to enjoy some late season fishing battles. And don't forget, fall is a great time to head up to the Puntledge River hatchery (and other hatcheries on the Island) to watch the annual return of the salmon to the their spawning grounds. It is a powerful sight. We continue to be blessed with great weather overall, so don't put the boat away yet - there is some great fall fishing ahead. Check out the photo below...these guys were well rewarded for a January afternoon on the water - three chinook weighing 14, 16 and 17 lbs. Great sizes for January! They were trolling deep in about 180 ft of water straight out from King Coho. The clown (multi-coloured) hoochie was the lucky lure. Looks like an early start to a super season! So get your boat and tackle ready, keep an eye on the weather and plan on some early fishing fun.